Rendering of meat and poultry production by-products and used cooking oils are environmentally friendly ways to recycle material that would otherwise be wasted. In short, rendering is recycling. If not rendered these perishable materials can create human and animal health hazards. Rendering allows for the recovery of fat, protein, and minerals from these raw materials for new uses. While providing these essential services and products, rendering also boosts sustainability of animal agriculture by reducing greenhouse gas emissions and conserving fuel and water. With a concept originating more than a hundred years ago, rendering meat and poultry by-products, and used cooking oil is the best and oldest way to recycle the by-products of animal agriculture. Recycling products that do not compete for human food resources and that would otherwise be wasted is the epitome of a sustainable process and essentially describes rendering. Rendering’s contribution to carbon emission reduction in the U.S. and Canada is equivalent to removing more than 12 million cars annually from the road. 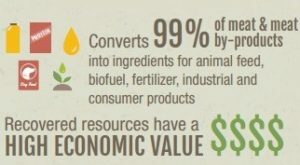 Rendering converts 99% of meat and meat production by-products safely into ingredients for animal feed, pet food, biofuel, fertilizer, industrial and consumer products. The rendered products produced in the U.S. and Canada meet or exceed government regulatory animal food safety standards. Rendering evaporates water from animal by-products during cooking. This large quantity of water meets federal, state and local standards so that it can be returned to rivers and streams. The main principles of rendering sustainability are: practicing environmental stewardship, caring for local communities, producing safe and nutritious food for the animals that will help to feed a growing world population, and producing biofuel feedstocks that contribute to sustainable and renewable energy production. All U.S. landfills would be full within four years without rendering, posing serious public health and environmental problems. Without renderer collection of used cooking oil from restaurants and other institutions, municipal sewer and wastewater systems could become clogged with if used oils are poured into water waste systems. This would not only compromise water quality, but would add costly damage and repairs. Without rendering, approximately 50% of the animal parts considered inedible by Americans would be wasted. Rendered products are used as ingredients in pet food and livestock feed, plus other products such as soaps, lubricants, detergents, renewable fuels, and more. Renderers in the U.S. and Canada invest more than €450,000 ($500,000) annually in research by the Fats and Proteins Research Foundation to seek solutions to challenges such as odor control. Rendered fats and oils account for 30% of the feedstock used in biodiesel and renewable diesel production in the U.S. 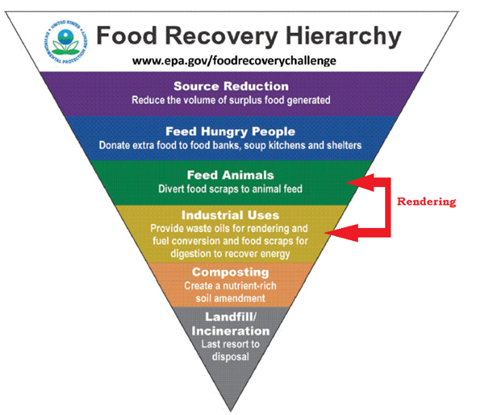 The rendering industry recycles more than 1.04 million tonnes (2.3 billion pounds) of meat and poultry from retail food waste which is used for animal food ingredients. The rendering industry recycles 1.08 million tonnes (2.4 billion pounds) of used cooking oils from foodservice operations, much of which is used for biodiesel production. National Renderers Association. Rendering Industry Sustainability Issues Brief. Originally introduced as a nitrogen-fixing rotation crop for cotton, peanuts replenish soil with essential nitrogen depleted by other crops.